Get ready for a thrilling adventure! In perdition in the desert, your only chance to survive is to find a legendary flying machine in the middle of the ruins of a city covered with sand. In this game of cooperation, work with your teammates to make the best choices and take advantage of everyone's abilities if you hope to escape the heat and insatiable sandstorm. 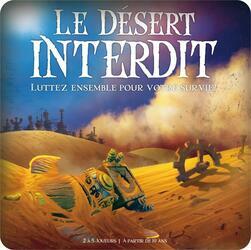 Will you get to take off in the flying machine or will you get stuck in the forbidden desert?